Bucharest, a city once called the Little Paris, could have been much more if not for the communist era. You will easily see this for yourself during this private communist tour of Bucharest, a tour marked by emotional visual contrasts, revealing the absolute opposition of two historical periods: the Belle Époque vs. the Communist Era. You will visit 2 areas that perfectly reflect these contrasts: the massive Civic Center, an empty shell admired mostly by foreign tourists and the beautifully restored Old City with its Belle Époque perfume. Walking around the Old City, you’ll be charmed by the gorgeous architecture of old palaces, by byzantine churches, bohemian cafes or 19th century houses. However, all of these historical treasures had to be rebuilt or restored. Why? To hide the marks of bullets, to hide scars that have not yet healed even though almost 3 decades have passed since the fall of communism and the bloody revolution. The Bucharest Communist Tour is more than a visual experience – it’s a story that takes you through 45 years of communism, allowing you to see beyond the city’s colorful present: Stalin and the enslavement of Eastern Europe, the genocide of KGB’s Secret Police, the Siberian deportation of farmers who refused to “donate” their lands to the state, the eradication of culture, free press or private property. To top it off, during this private communist tour we’ll bring along old photos: see how the streets used to look, how people dressed-up, worked or lived. Behind Stalin’s Iron Curtain? There was no good or evil, no black & white. Not even grey. Just red. This remarkable half-day tour was one of the highlights of my entire two week trip to Europe! It was a tremendous pleasure to be escorted to some of the city’s key sights and to have their significance explained to me — especially with regard to this marvelous country’s unfortunate interlude as a brutally-ruled communist nation and the revolution of 1989 that ushered in a new era. Mihai’s extensive knowledge enabled him to answer my questions with a degree of fascinating detail that I appreciated very much. Testament to Mihai’s excellence as a guide lies in the fact that, during my remaining days in Bucharest, I felt moved to wander through the city again, re-examining the sights and allowing my new understanding of their history to affect me anew. I think that Mihai’s love and enthusiasm for his newly-flourishing hometown is catching! Read more of our customers’ reviews on TripAdvisor! Duration: 3-4 hours. Refreshment/coffee stops can be requested. Walking distance: 4 km, slow-paced. Sightseeing tour designed around a story. A stop at a major attraction unfolds a new chapter. A chapter may describe: current attraction, historical events, daily life in communism, fun facts. Ask questions at any time on the things you like. Enjoy yourself – it’s a private tour! Deeper understanding of the communist era: photos & authentic postcards, coins, military badges etc. Along the way, you’ll see the major squares and buildings where the action took place during the anti-communist revolution. Visit the centers of socialist power, the massive structures of the Civic Center symbolizing the might of the regime and also the places that suffered deeply during communism. Other important landmarks: Former HQ of Secret Police, Memorial of Rebirth, former HQ of Communist Bank, State Archives (still covered by marks of bullets), Antim Monastery (one of the many mutilated churches), the boulevard of “Socialist Victory” and many other. 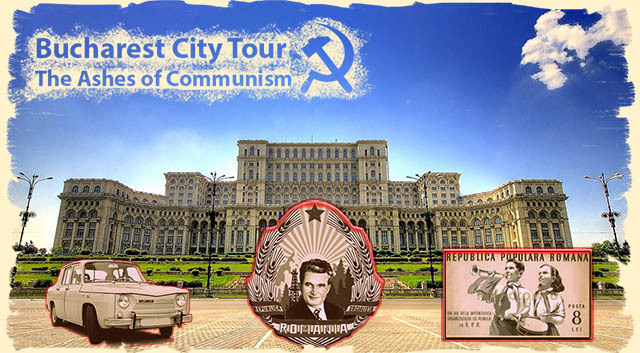 Book the Communist tour of Bucharest! The Ashes of Communism – a journey of visual contrasts. A story that reveals unhealed scars. Go back in time and look behind the Iron Curtain! 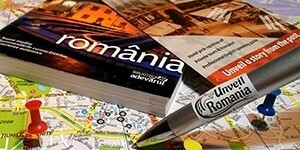 Enjoy one of the most intriguing tours of Bucharest!